Liman, Mariana (2005) Penyesuaian diri remaja akhir dengan pola makan lacto-ovo vegetarian dalam keluarga non vegetarian. Skripsi thesis, universitas Tarumanagara. "The purpose of consuming research is to understand about process of seii- adjustment by teenager with eating behavior Lacto-Ovo Vegetarian in Non Vegetarian family. The research has 5 subject of teenager, 2 male and 3 female around 18-22 years old, and included teenager in last development stage of their age. The first research was conducted on 3“ December 2004 until 15 January 2005. The data iii/as acquired and analyzed using Haber and Runyonis (1984) theory. 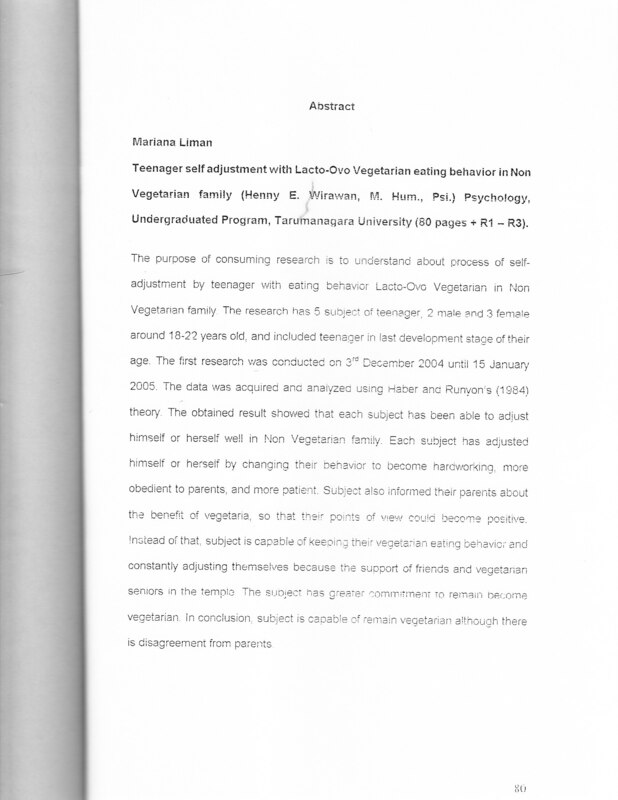 The obtained result showed that each subject has been able to adjust himself or herself well in Non Vegetarian family. Each subject has adjusteo' himself or herself by changing their behavior to become hardworking, more obedient to parents, and more patient. Subject also informed their parents at:-cut the benefit of vegetaria, so that their points of wew couid become positive. instead of that, subject is capable or"" keeping their vegetarian eating behavior and constantly adjusting themselves because the support of friends and vegetarian seniors in the temple The suoject has greeter commitment to remain become vegetarian. ln conciusionx subject is capable oi remain vegetarian although there is disagreement from parents. "